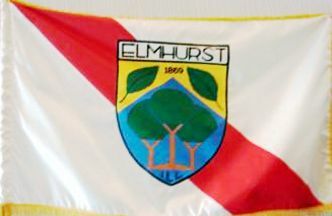 Elmhurst is a suburb of Chicago. The flag is white, with a descending broad red diagonal; over all the seal of the city. (b) The seal of the city shall be and remain in the exclusive custody of the City Clerk. (c) Except where otherwise provided by the Illinois Revised Statutes, the seal of the city, when used, shall be affixed by the City Clerk only."